In 1975 – long before the days of personal bucket lists – Spartanburg, South Carolina native John Bryan, an early Freewheelers member, set out to ride from his hometown to the top of Mt. Mitchell, the highest peak east of the Mississippi. He enlisted a group of hardy Freewheelers, who were up for the challenge, to join him on the 103-mile ride. Bryan’s inaugural ride evolved into what is now known as The Assault on Mt. Mitchell®. 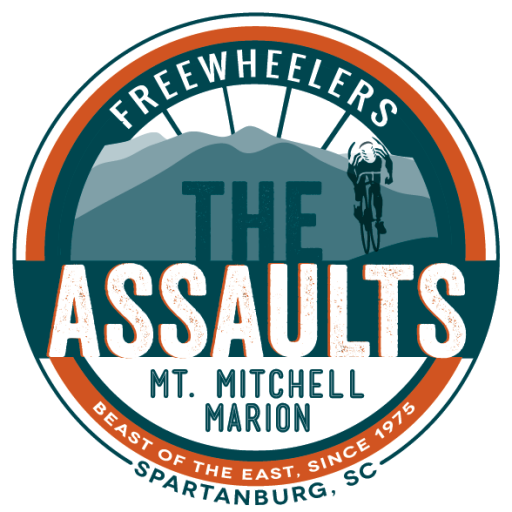 Increasing interest lead The Freewheelers to create The Assault on Marion®, a shorter, simultaneous sister ride from Spartanburg to Marion, North Carolina, in 1993 as a way of opening up the ride for more cyclists to participate. Together, the two rides are known as a singular event – The Assaults. Founded in 1973, The Freewheelers Club is a Spartanburg, South Carolina-based community service organization whose mission is to provide bicycle safety education and promotion, and a forum for amateur sports competition and touring. To learn more about The Freewheelers Club and how you can join, visit their website at http://www.freewheelers.info. In 2015, due to the success of The Assaults and the opportunity to enhance charitable giving, The Freewheelers created a 501(c)(3) sister organization, The Freewheelers Cycling Association. The Freewheelers Cycling Association (FCA) uses a portion of the proceeds generated by The Assaults to support other non-profit organizations, including Finish-Strong cycling team, Partners for Active Living, the Challenge to Conquer Cancer, the Humane Society, the Mid-Atlantic Chapter of Multiple Sclerosis, Mt. Mitchell State park, the Blue Ridge Parkway, the Palmetto Cycling Coalition and others. To learn more about The Freewheelers Cycling Association visit their website at www.freewheelersassociation.org.